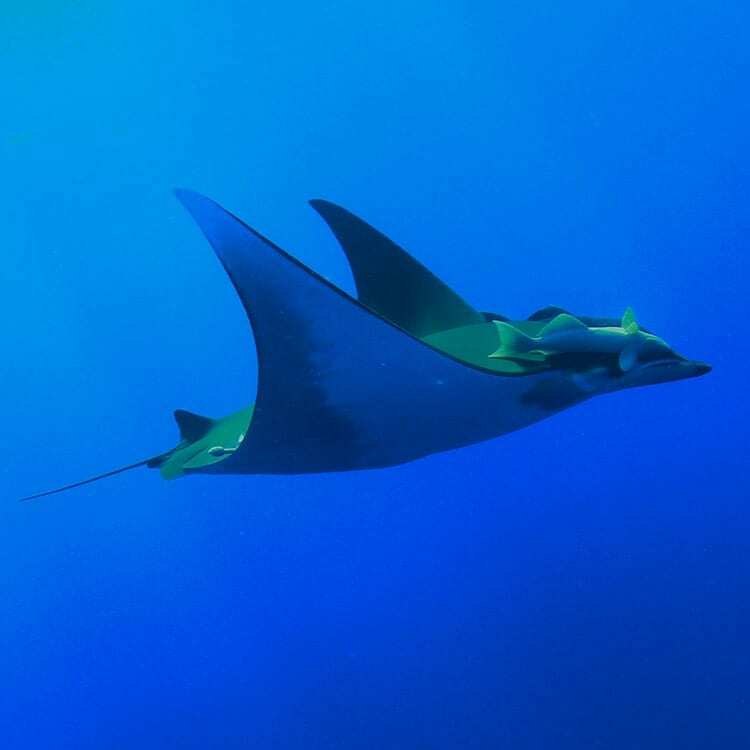 Thought to dwell mostly near the ocean’s surface, Chilean devil rays (Mobula tarapacana) are most often seen gliding through shallow, warm waters. But a new study by scientists at Woods Hole Oceanographic Institution (WHOI) and international colleagues reveals that these large and majestic creatures are actually among the deepest-diving ocean animals. “Data from the tags gives us a three-dimensional view of the movements of these animals, and a window into how they’re living in their ocean habitat—where they go, when, and why,” Thorrold added. “Rays were always seen in very warm water up at the surface, so why would they need an adaptation for cold water? Once we looked at the dive data from the tags, of course it made perfect sense that the rays have these systems. Sometimes they’re down diving for two or three hours in very cold water — two to three degrees Celsius (35.6 to 37.4 degrees Fahrenheit),” Thorrold said. 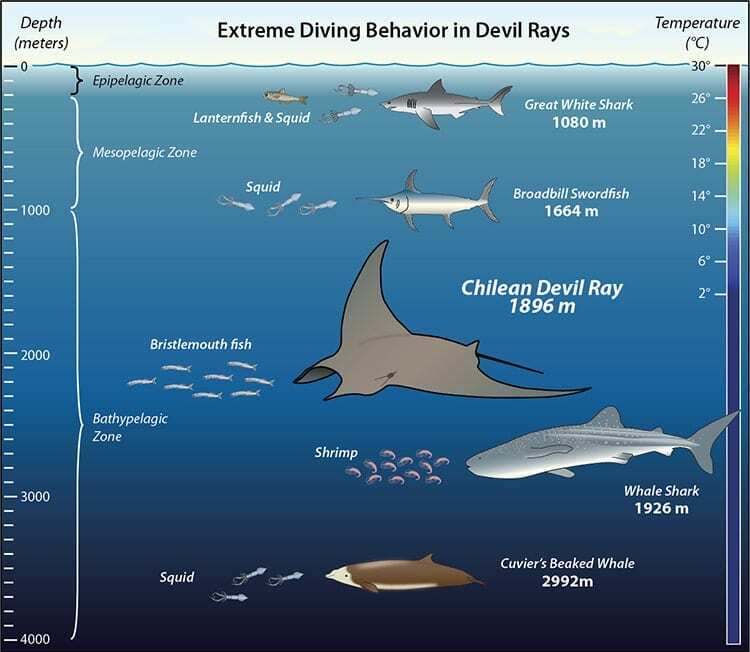 While it’s not certain what the rays are doing at these depths, the dive profiles suggest that they’re foraging on large numbers of fish that live in deeper waters. “Ultimately, answering whether these animals depend on the deep layers of the ocean for their feeding and survival could have major implications for their management and that of oceanic habitats,” added co-author Pedro Afonso, a researcher at the Institute of Marine Research (IMAR) at the University of the Azores and the Laboratory of Robotics and Systems in Engineering and Science (LARSyS). Researchers from the King Abdullah University of Science and Technology (KAUST) and Massachusetts Marine Fisheries also contributed to the study. Funding for this research came from the National Science Foundation, The Harrison Foundation, Rodney and Elizabeth Berens, the King Abdullah University of Science and Technology, Portuguese Foundation for Science and Technology/ Ministry of Education and Science, the LARSyS Strategic Project, and WHOI. Devil rays, which can grow as large as four meters (13 feet) across, are ocean nomads traversing large areas of the ocean. 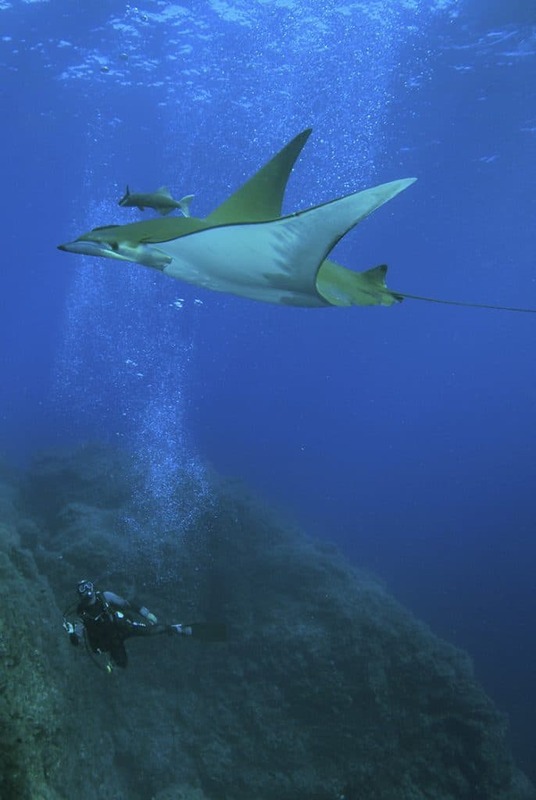 Researchers utilized pop-up satellite archival transmitting tags to record the movement patterns of 15 Chilean devil rays in the central North Atlantic Ocean during 2011 and 2012. Mainly thought to be surface dwellers, Chilean devil rays (Mobula tarapacana) are actually among the deepest-diving ocean animals.